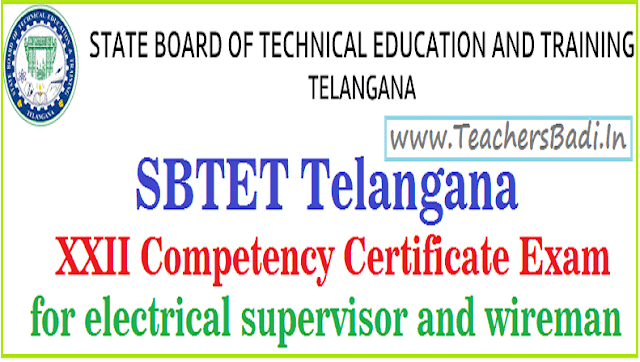 SBTE Telangana has given for XXIV Competency Certificate examination for electrical supervisor and wireman. 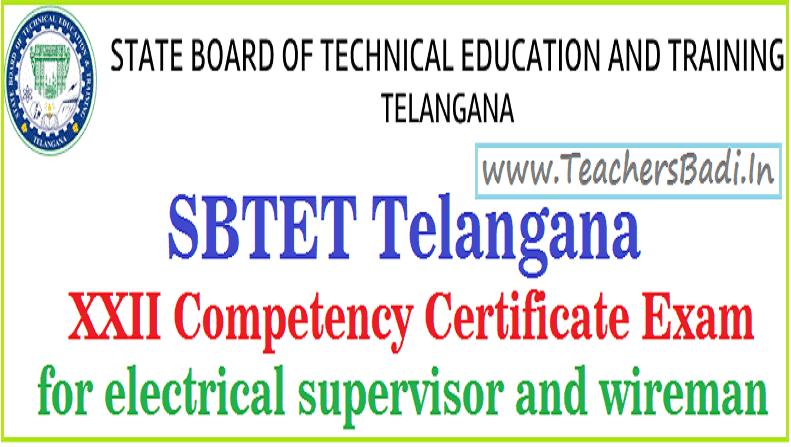 The State Board of Technical Education and Training, TS, Hyderabad will conduct XXIV session of Competency Certificate Examination for Electrical Supervisor and Wiremen in June-201* on behalf of the Chief Electrical Inspector of Government/Chairman, T.S. Electrical Licensing Board, Hyderabad under Andhra Pradesh Electrical Licensing Regulations Act-1987. The candidates for admission to the “Wireman Competency” Certificate Examination shall be a person with four years experience, shall be certified by a Firm or a Licensed Electrical Contractor and Countersigned by an Electrical Engineer not below the rank of Asst Divisional Engineer in TS TRANSCO/TS GENCO/TS DISCOMS or Deputy Electrical Inspector in the Electrical Inspectorate. He shall have completed the age of 18 Years as on 1st January 2018.
a) A pass in 10th class or its equivalent with not less than 08 years experience in the practice of Electrical Installation works, and the said experience shall be duly certified by a Firm or Contractor. b) A Wireman/Electrician of I.T.I. Certificate Holder with not less than 04 years experience in the practice of Electrical Installation works, provided further that a candidate seeking admission to the Supervisor (Mines) Examination shall have at least 2 years experience in under ground Mines out of the total 4 years experience mentioned above and the experience shall be certified by a Firm or Licensed Electrical Contractor and Countersigned by an Electrical Engineer in TS TRANSCO/TS GENCO/TS DISCOMS or Electrical Inspectorate not below the rank of Divisional Engineer or Deputy Electrical Inspector. c) Age limit: The minimum age limit for appearing for examination shall be 20 years as on 1st January, 2018. 1. Govt .Polytechnic, Masab Tank, Hyderabad. 2. J.N. Govt. Polytechnic, Ramanthapur, Hyderabad. 9. SS Govt. Polytechnic, Zaheerabad, Medak Dist. NOTE: If number of candidates registered for Wireman examination at any of the above centers are less than 25, then the candidates will be re-allotted to some other centre at the discretion of the Secretary, State Board of Technical Education and Training, T.S., Hyderabad. 2 J.N. Govt. Polytechnic, Ramanthapur, Hyderabad. 8. Govt. Polytechnic, Kothagudem, Khamman Dist. For Supervisor (Mines) Examination Centre. i) For Wireman - Rs.1,000/-. ii) For Supervisor - Rs.1,500/-. Application forms of the above said examination can be had from the Principals of the Polytechnics mentioned (i.e. examination centers) below by sending Crossed Demand Draft for Rs.100/- (Rupees One Hundred only) drawn in favour of the Secretary, State Board of Technical Education and Training, T.S., Hyderabad payable at Hyderabad towards cost of application form and instructions. The drafts issued by Andhra Bank, State Bank of India, State Bank of Hyderabad, Syndicate Bank and Canara Bank will alone be considered. All postal requisite must be accompanied by a self addressed envelop of 11 cm X 25 cm size with stamp affixed to a value of Rs.15/- for Ordinary Post and Rs.30/- for Registered Post and shall be addressed to the Principal concerned. Application forms will neither be sold nor filled in application forms received by the Secretary, State Board of Technical Education and Training, T.S., Hyderabad. By way of Crossed Demand Draft in favour of the Secretary, State Board of Technical Education and Training, T.S., Hyderabad payable at Hyderabad and drawn on any of the above mentioned Banks. 1. Receipt of filled in applications: The filled in application forms together with relevant documents and examination fee should be submitted to the Chief Superintendent/Principal of the examination centres given above where the candidate intends to appear on or before 15-06-2018 at 5-00 P.M. Filled in applications should not be sent to the Secretary, State Board of Technical Education and Training, T.S., Hyderabad under any circumstances. Filled in application forms received after the due date on account of Postal delay in transit or loss will not be considered and will be summarily rejected by the Principals concerned. 2. Fee once paid will not be refunded in case the application is rejected. 3.For details on “How to apply” and syllabus refer for the instructions to candidates supplied along with the application form. Candidates desirous to appear for the Supervisor Examination in URDU Medium should appear at Govt. Polytechnic, Masab Tank, Hyderabad only. d) The dates of Electrical Wireman Examinations will be fixed and communicated by the respective Chief Superintendent of Examination Centers.